Motorists being turned away from Oilibya petrol station in Bomet town. Motorists have for the last three days been stranded in Bomet County following an acute shortage of petroleum products. Fuel stations reported depleted stocks of the precious commodity on Sunday. Dealers say there was a supply hitch at the Nakuru Kenya Pipeline depot. Major outlets in the region including Oilibya, Riva and Kobil ran out of diesel and premium products with operators expressing fear the biting shortages would last a couple of days. "We placed orders for the products two weeks ago but it has not been delivered," said a dealer in Bomet town. "For the last two days, we are being charged Sh 150 from Bomet town to Sotik by matatu operators from the previous Sh 100. We hope the matter will be addressed urgently," said Mr Benard Korir, a resident. Boda boda operators were also grounded as a result of the shortage, with commuters being forced to trek long distances. 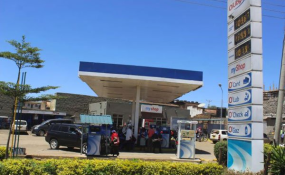 Motorists were forced to source the products from outlets which still had stocks in Litein town in the neighbouring Kericho County and while others fuelled in Narok County.